But anyway, the big thing I noticed over breaky this morning was how I’ve gone from NWA to NPR. I used to start my day over a big bowl of Fruit Loops and Eazy-E singing Dope Man. Then, I’d kiss my wife Aileen goodbye as I headed off for work to my job at the ferris wheel only to hip hop into my PT Cruiser bopping along to MC Ren singing Dope Man. These days…you guessed it – NPR. I love National Public Radio for pretty much the same reasons I loved hip hop music. It eases me into my morning drive, drives that morning’s nonversation around the metaphorical office water cooler and drives the demons from my mind. Then, lastly, I could oust my urge to mow down most of humanity by listening to NWA do the job for me. Go lads go! 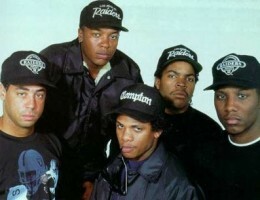 NPR is the same as NWA, and it’s free, although I guess you could download NWA from iTunes. But I wouldn’t suggest it. This entry was posted in Stories For Bottoms and tagged drive the demons from my mind, Eazy-E, ferris wheel, I've gone from NWA to NPR, Ice Cube, MC Ren, morning drive, national public radio, NWA, pt cruiser, the brutal times, tokyo, top hats, water cooler. Bookmark the permalink.